Welcome to the fourth day of the BridgeAthletic Building Blocks Progression. Today we are introducing the Dumbbell Deadlift. The Dumbbell Deadlift is one of our favorite exercises at BridgeAthletic. We encourage all athletes to perform this for at least 1 to 2 phases before attempting to use a Barbell or Hex Bar. Allow your body, especially your spine and joints to adjust to the load relative to the movement pattern. We encourage all athletes to perform this for at least 1 to 2 phases before attempting to use a Barbell or Hex Bar for this movement. Allow your body, especially spine and joints to adjust to the load relative to the movement pattern. As a coach and athlete you can use this at almost all levels and training phases, and is an excellent rehab/return to play exercise. Select DBs that you could perform for 3 reps more than what is prescribed. 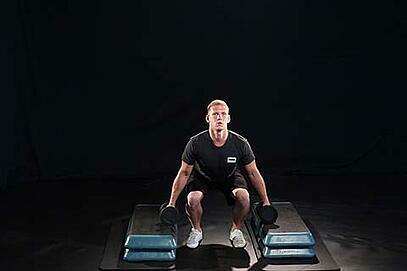 Set up a box or a stack of plates with a starting point at mid-shin height. As you improve over time, lower the starting point to within a few inches of the ground. Stand with your feet slightly wider than shoulder-width apart, toes rotated out slightly. Keep your chest up and back flat throughout the movement. Remember, this is an up-down movement, so the pause/rest phase is at the starting point, not when you are at full extension. Keep your chest up and hips down, squat down and grab hold of the DBs. With a controlled movement, standup without locking out your knees. Slight pause. Return to start position. Pause for a 2-Hippopotamus count to emphasize control. Repeat in a controlled tempo for the prescribed reps, and without crashing the DBs in to the box/stack of plates.